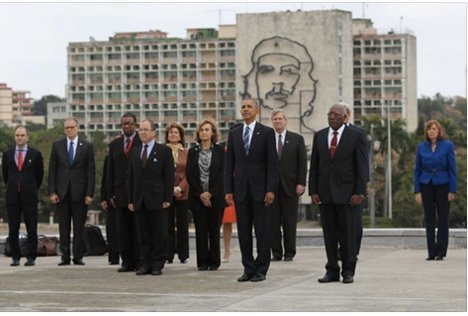 The larger-than-life portrait of this communist animal’s head in the background reminds me of the past. In 1987, I visited Romania under Ceausescu. At the time, I lived in communist Czechoslovakia and we were only allowed to travel into other communist countries. As a rule, the further east you went, the poorer and more communist-ravaged the land and population. I saw similar huge portraits of the Romanian dictator on walls and buildings. Streets were literally lined with them: Big Brother everywhere! Four years later, they would all be torn down and destroyed – and the Great Dictator also killed, Mussolini style, but 1987 was still marked as the Dark Ages of Communism. At that time, Romania was as poor as it gets: naked children lined the train coming from “the west” begging for anything we could spare, hungrily reaching out, gathering candies from the ground. A trip east for us was the trip to our own future then… At night, the train was invaded by hordes of thieves and whatever was not securely attached was stolen. I recall the person sleeping on the bunk above me had her trunk picked from under her head and pulled out of the window as she was lying there, not even asleep – all of a sudden, the window slid open and someone pulled the trunk out. It happened in a matter of seconds! However, what surprised me the most was the absolute lack of complaints. People looked haggard, depressed, but tough. When you spoke to them, they rejoined in proud communist gestures. We had a carton of powdered milk we did not use by the time we were leaving so we decided to exchange it for a souvenir. I do not recall want knick-knack bric-a-brac it was, a pleated basket, a folklore napkin, perhaps… All I can recall is a lanky old man staring straight back at me with spite in his eyes saying in broken German he did not want my milk. I asked why. He went back behind a drape and returned with a can of beans in one hand and a framed portrait of Ceausescu in the other. “I have this – and this!” he said, flashing a row of teeth decayed by years of socialist healthcare. Watching these “interviews,” one can only marvel at complete absence of any criticism! To me, however, it is self-explanatory, although it cannot quite be explained in words: ideology beats reason. Criticism is what makes US better – individually and as a society. Criticism and dialogue is what undermines every totalitarian system at any stage of development, what reveals corruption, discloses deficiencies. Here, in the United States, we believe in Pragmatism, tempered by meliorism. Pragmatism says that the effects caused by an object define that object. In other words, our concepts are not ideas but effects. Meliorism says that we cannot achieve perfection in anything but this should not detract from our trying constantly to improve. We also believe in work ethics, especially those tied to Protestantism: a healthy individual is the source a healthy society – healthy in the mind and in the body. We cannot achieve greatness by stealing or ravaging. I grew up in communism – to criticize the system was the most grievous of transgressions. Murderers used to receive less “time” than “political rebels.” We have all heard of the American student sentenced to 15 years of hard labor for allegedly stealing some advertising plaque. Imagine if he had actually smuggled in George Orwell’s Animal Farm or 1984 and wanted to distribute it in some unofficial manner! Do you recall what the motto of the Colonists was around the time of the Townsend Acts, in particular the Stamp Act and the Tea Act? To remain silent in face of such exploitation was deemed un-American and treasonous! Those who sat at home in silence were “not real Americans” but traitors complicit in the evils of the Crown! No Taxation without Representation meant that “no private property” could be taken “without the consent of the owner!” Paradoxically, this motto was founded on the strict property laws of Great Britain. Imagine someone taking a picture with the portrait of King George and having it published in Ben Franklin’s paper! Well, we don’t – and we won’t! We are the Land of Doers, not empty-headed “dreamers” and organized disrupters who want to silence US!